While playing for the Japanese Pacific League’s Chiba Lotte Marines in 2010, Tsuyoshi Nishioka hit .346/.423/.482 with 22 steals, 11 homeruns and 8 triples. Just 25-years-old, Nishioka had eight years of experience at Japan’s highest level. He was ready to take his talents to America. The Minnesota Twins meanwhile, were the two-time defending AL Central Division Champions. With their still shiny, new stadium and franchise player locked up for eight years, another a postseason appearance seemed imminent. It was time to think outside the box. Ultimately, the Twins paid Chiba Lotte $5 million to purchase Nishioka’s rights and inked the switch hitting infielder to a 3-year contract worth $9 million. 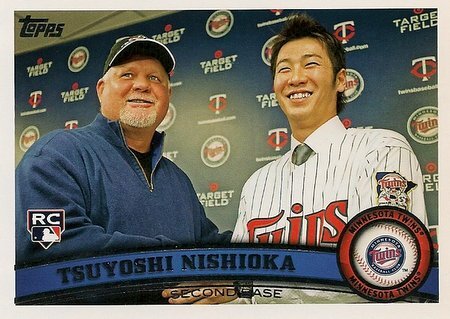 At the December press conference, an ecstatic Ron Gardenhire and Bill Smith hyped the 5-time Japanese All Star’s ability to bring “speed” to their line-up and “great range” in the field. After playing his last 616 games in Japan at shortstop, the Twins initially decided Nishioka was better suited at second base in the U.S. A week into his major league career however, Yankees outfielder Nick Swisher slid hard into second attempting to break up a double play. Nishioka was in his way. The rookie infielder broke his left fibula in an ugly collision and missed the next 59 games. At the time of the injury, he was hitting .208 (5-24) with 2 errors. Nishioka returned to action on June 16 at shortstop. Production wise, he picked up where he left off in April, hitting just .226/.278/.249 with only 5 extra base hits – all doubles – in 240 plate appearances. He stole 2 bases in 6 attempts and made 12 errors in 68 games. The Twins finished last in the AL Central in 2011, going 63-99, their worst record since 1982. With their farm system dried up and starting rotation in shambles, Nishioka was hardly the most significant reason for the Twins worst season in a generation, but he was the most visible. He quickly became the symbol of the team’s sudden and epic collapse. Prior to the 2012 campaign, Nishioka was assigned to Triple A Rochester. He stayed with the Red Wings until a rash of infield injuries prompted a recall in August. This time, he lasted just three games with the Twins, going 0-12 and committing 2 errors before heading back to Rochester. It was now clear the Tsuyoshi Nishioka experiment was over, but nobody was sure how it would end. The Twins still owed the struggling infielder over $3 million and hoped to reach a settlement. It set the stage for his finest moment as a Twin. Acknowledging his failure, Nishioka waived the remainder of his contract and requested his release, forfeiting all of the guaranteed cash. Without paying him another dime, the Twins were rid of their most notable free agent bust. When a highly touted players flops, one who is earning millions, it’s easy to forget they are a living, breathing human being. This is especially true in the case of Nishioka, who couldn’t directly communicate with the media, fans or even his own teammates. “We tried to talk about as much as we could,” Twins third baseman Trevor Plouffe told me in 2013. “I thought he was a good guy, he liked to work hard. Things just didn’t go his way here. This is definitely a tough level to come over here and not know the language and not know customs and have the food you are used to and all that stuff. It’s a huge jump. You could tell it was pretty difficult for him.